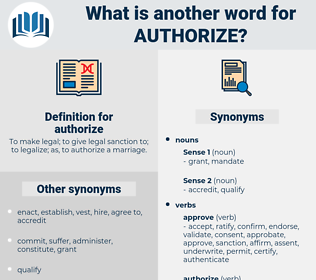 What is another word for authorize? To make legal; to give legal sanction to; to legalize; as, to authorize a marriage. 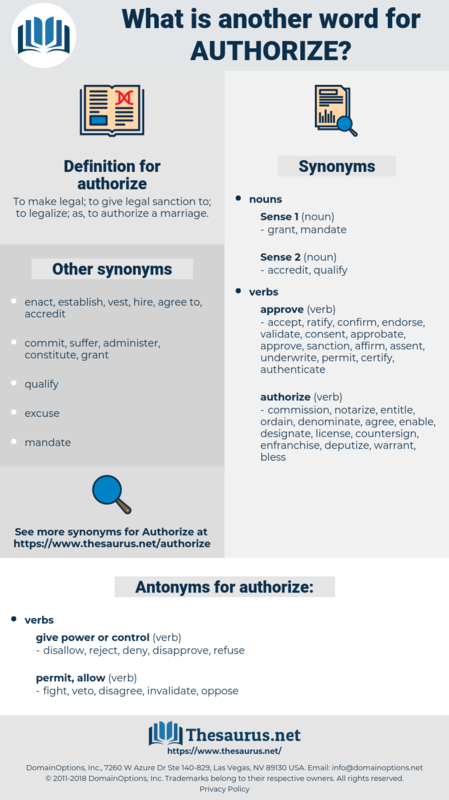 approved, Grants, ratify, endorse, endorsed, accept, accredit, entrust, delegate, standardize, standardized, Gives, condone, confer, tolerate, ratification, agree, certify, appoint. disallow, reject, deny, disapprove, refuse. disqualify, bar, neglect, disable, illegalize, impede, disenfranchise, obstruct, shut out, rebuff, spurn, disregard, Disempower, stop, decertify, disbar, rebut, constrain, hinder, veto, hold back, prevent, negative, overlook, turn down, block, ignore, decline, ban, exclude, discourage, disfranchise. These annoyances were of such a character as to induce the general government to send two companies of military to the Falls, to authorize the raising of militia in Kentucky and the invasion of the hostile territory. The legislature, influenced more strongly with the same apprehensions, has restrained the Directors, as the Directors have restrained their servants, and have gone so far as to call in the power of the Lords of the Treasury to authorize the acceptance of any bills beyond an amount prescribed in the act. autarky, authorise, Ataturk, addressee, auto race, atherurus, atresia, ataraxic, athyriaceae, address, atreus, atarax, Ader Wax, autarchy, authoress, autarchic, ataraxia, atrocious, at work, autarkic, ataraxis. certificate, sanction, license, validate, commission, approbate, formalize, formalise, okay, certify, licence, declare, O.K., approve.